Let's Go. Let's return to Florence. 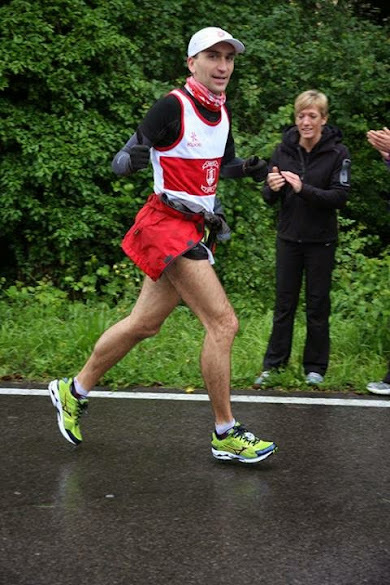 I ran 3 times the 60 miles distance on the road (only finished twice) and each time between Florence and Faenza, Italy. 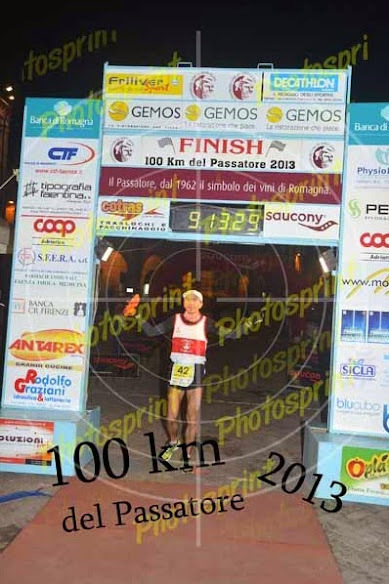 This is the bigest 100km race in Italy and I always finished in the 50. 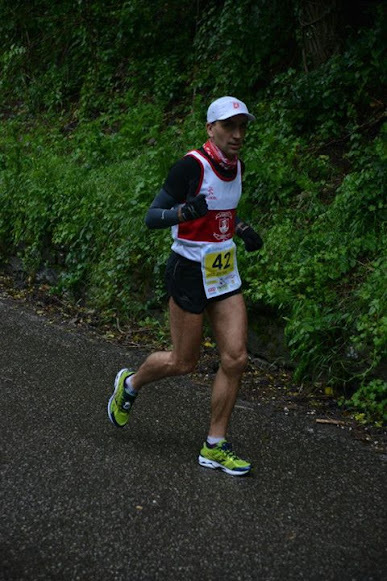 The level of the runners is very high with the triple world champion (Giorgio Calcaterra) who won the last 7 years in less than 7 hours and sometimes less than 6:30. The stories remain, I am older and I'm going back! In September 2012, I moved to Ireland and it would probably be more difficult to cope with the heat. Normally the temperature is between 25 and 30 degrees at the start in Florence. My training over 9 weeks for this race is completed. I managed a race during the preparation in Connemara 63km (4:40 ') and a marathon in 3 hours Limerick during a week with high mileage. The only unknown is the weather. And well, let say that I'm lucky: it is 8 degrees in Florence and there are lots of showers like they say in Galway. Not rain, but showers! My training is just perfect compared to the 2,000 registered runners with 1500km ran with this weather (only 1750 will start and 1450 will conclude the 100km which is just exceptional for an ultra 100km). 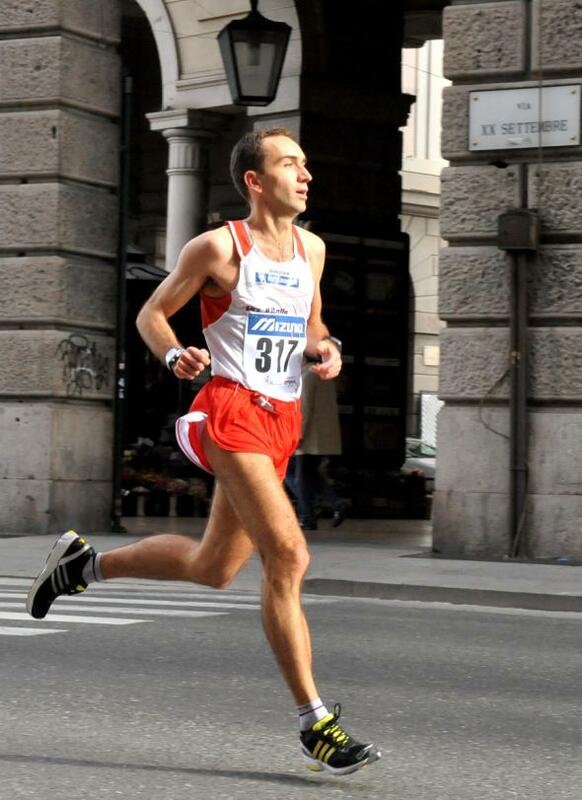 I just found a friend from Torino: Silvio Bertone on the starting line. So nice to find "old friends". We are waiting under the rain, that Matteo Renzi launch the race. Silvio wants to run for 8 hours so I hope to be close to him during the race. Another plan that will not happen because Silvio started so fast, and reached the Pass about 15 minutes before me, and finished 11th in 7:55. Well done to him. So let's go at 3pm. The route around the Duomo has changed and my fans missed the start. It starts well. I wear my gore tex jacket with the hood over my head. I have as well a white hat that I will keep during the full the race. I'm focused and concentrate to my speed. It starts fast and my GPS cannot get the signal at the start.My friend Silvio is at the 5km mark in less than 20 'in the top 10. This year we pass in front of the Duomo, the start in Florence is slightly modified. Probably to avoid the congestions we create out normally. My supporters did not see me because of these modifications. Finally, it is not a 100m and they will have time to see me later. Before starting the climb to Fiesole, I take a glass of water despite the rain. I'm sweating with the jacket and it is important to eat and dring well. My GPS did not get the signal at the start because of the narrow streets and tall buildings. In km5, I only get 3.54km and I ran in 22'13''. 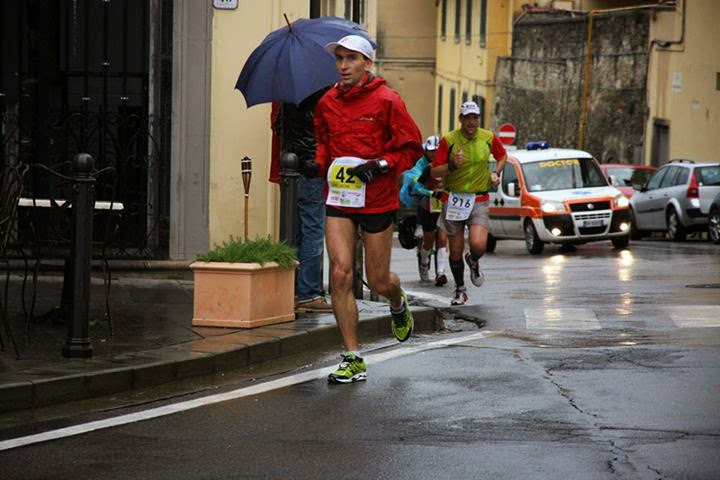 I'm a little too fast (I had to go in 23'35'' to finish in 8h) but it is always difficult to start reasonably in Florence. 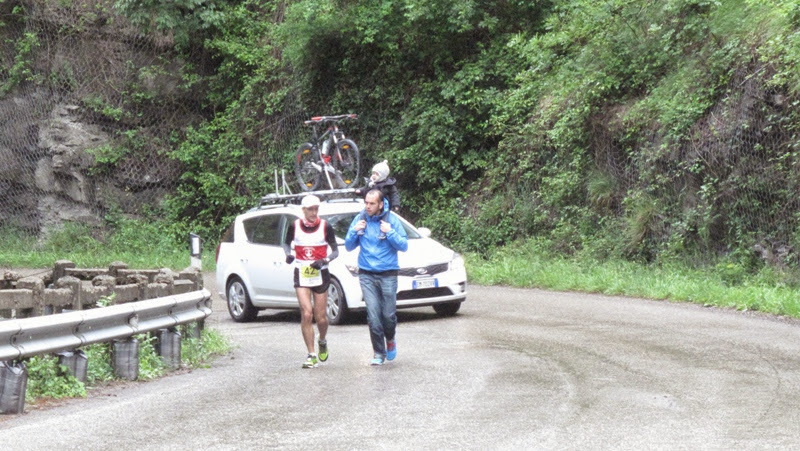 In the ascent to Fiesole, Vasiliy Neumerzhitskiy (the winner of the UTRA Connemara who will finish in 8:19 ') overtook me. 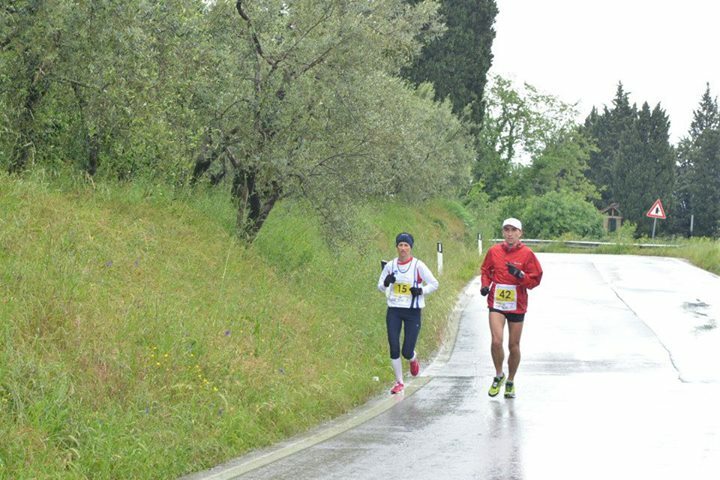 We discuss briefly about the weather which is more Irish than usually in Toscany this Saturday. then he kept the same pace to climb and I let him go. It is far too early to push the body. This year I did not take advantage of the beautiful view of Florence because the clouds blocked the view. 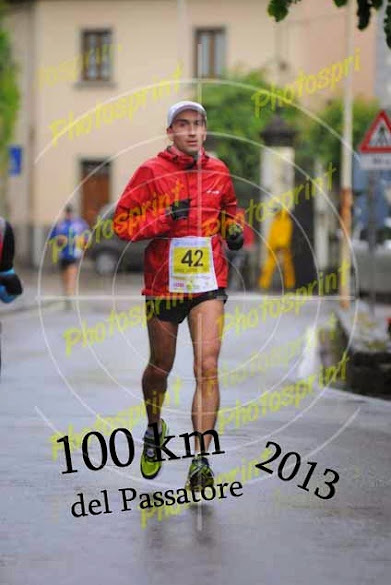 In the climb I try to slow down, but at km10 I ran the fraction in 25'01'' (ideally I should have run in 26'29''). So it was with more than 3 minutes in advance that I arrived in Fiesole. The legs are fine and the initial climb is over. I take my first gel that I rince with two glasses of water. Despite the weather, the public is here to encourage us. The road to the pass is one of the fastest part of the course. We begin to focus on speed, it is almost flat and the view of the Tuscan hills is superb. The clouds are higher and the rain stops. I opened the jacket, then removed it and attached it arround my waist. 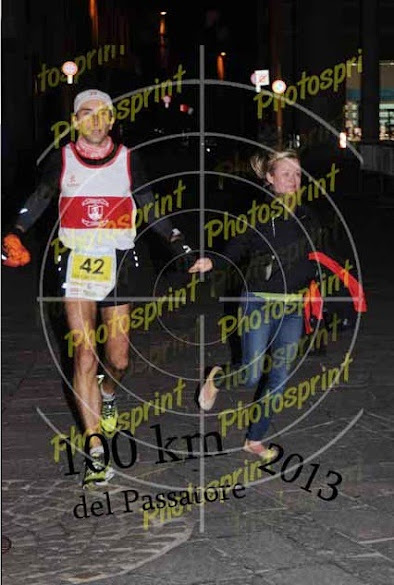 The first lady just overtook me: the Croatian Marija Vrajic who won in 8:06 '. Arriving at Pass "Vetta Croci" there is always a lot of peoplewho encourages us. These last two corners are really impressive: like Tour de France. 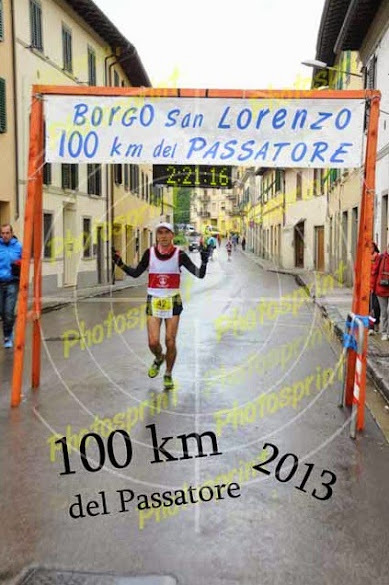 I dive into the descent to Borgo San Lorenzo. In the way down I'm overtaken by the second female Sana. She is followed by three cars. They are really bad drivers and just stop every km directly on the road, without stopping the engine. It is so dangerous because the road is open and it makes the road even more dangerous for the runners. Once I will have to run in the grass to avoid the "traffic jam" they created. Unfortunately I am racing at the same speed as this runner and will have to see these cars during few hours. The rain starts over again and at the refreshment base in Polcanto I put again my jacket. 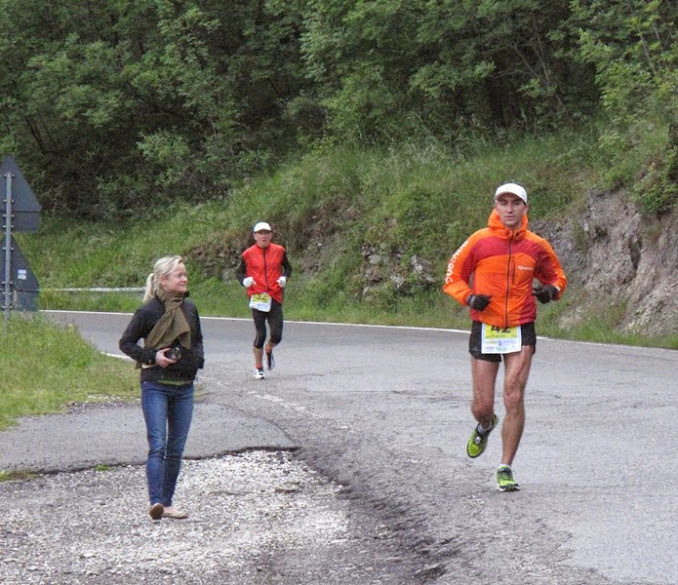 The strong downhill was the cause of my DNF (Do Not Finish) in 2010. I ran down too fast and my right knee could not cope. Since, I fear the slope and try to be as smooth as possible. 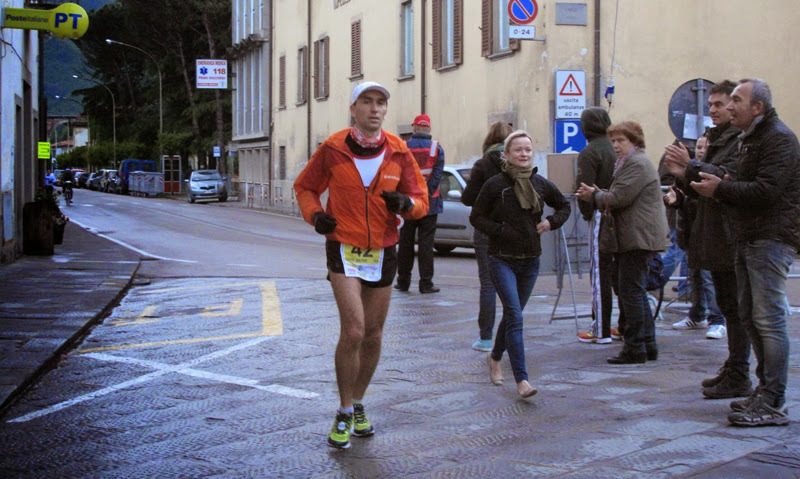 At my arrival in Borgo San Lorenzo I see Nico (I give him my jacket because the rain stopped) and then I ran few hundreds of meters with Helen. It goes well the stomach is OK and legs too.These first 30 kilometers just went smooth and I'm in much better physically than during previous editions. 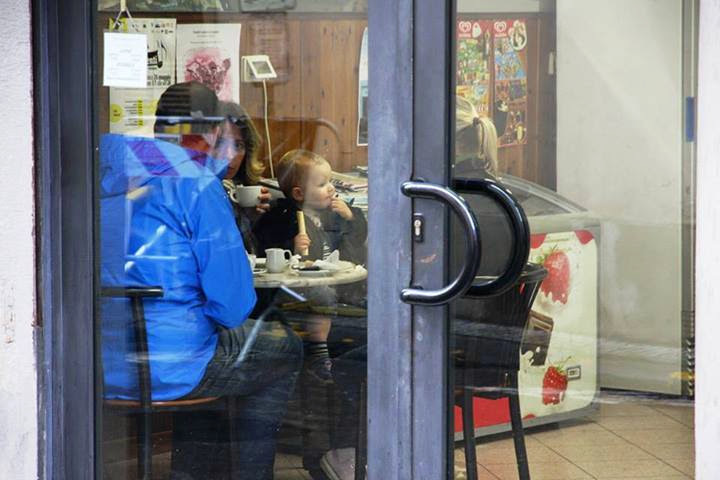 The route is slightly modified to avoid the pedestrian area in Borgo San Lorenzo where we had to pay close attention to pedestrians, children, dogs, strollers during the Saturday afternoon! We ran left to the more quiet street. 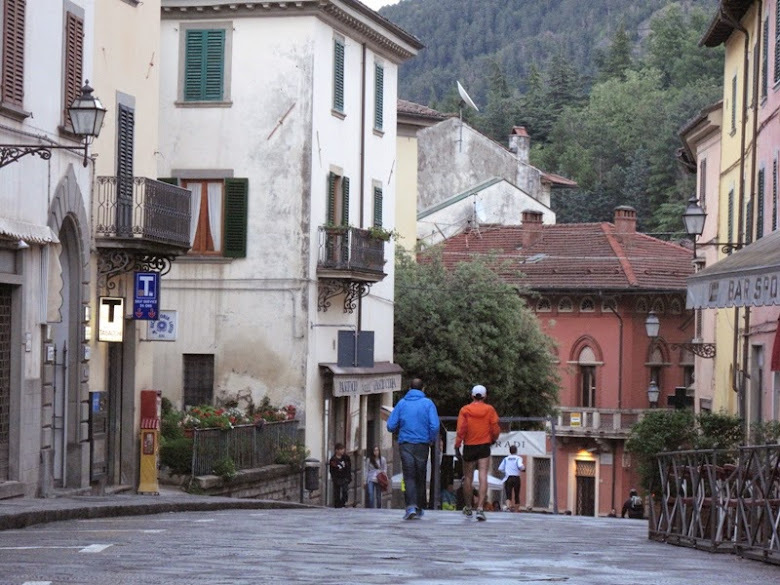 At the end of Borgo San Lorenzo a beautiful slope is just increasing the race difficulty. It goes up and you really need to wait before taking back a good speed. It is short but intense. I can take a good pace on the straight line which leads us to Panicaglia at km35. Every time I arrive at this refreshment point I began to struggle but this year the legs are good. We begin to raise slightly to Monta. This is from Monta that we need to put the small gear ratio. I have 5 minutes ahead of my time in 2012 and just in time to finish in 8 hours. Just after the pass, I stop at the refreshment station. The stomach starts to get a little sick. It left for 52km "descent". Vasiliy overtake me for the second time. 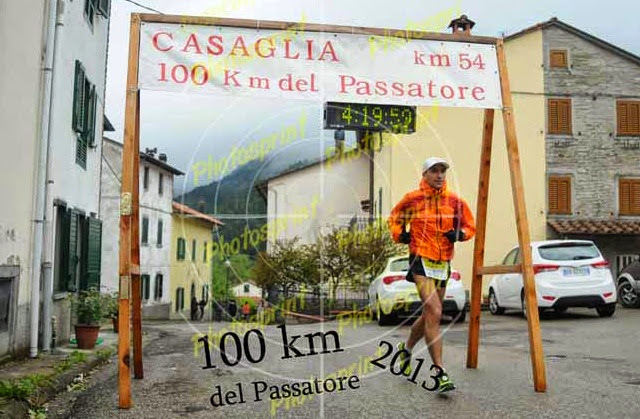 He had to stop at the pass to take his bag (the organizer can bring a bag with your food / clothes at km48). I did not expect to meet him before Faenza. At km50, there is always that group that encourages us with the loud music, a big tent, barbecue, beer.The tent is so great that Vasiliy stops there in believing that it is a refreshment station. I arrived in Maradi, but the wall of the 100km is just ahead of me with my friends. I go faster than last year, but this fraction from the pass was extremely slow. I'm tired physically. I should arrive fresh to perform on an ultra race and I'm not fresh. The end of a long race! Very long. It's still a marathon ahead of me! Nico sees that I'm done, but I keep walking and go to the refreshing station. I redo my laces little widder because the feet swell. I left all the next refreshment station walking. Then start to run very slow. It is night falls and I do not see the fireflies as usual. This year it's more fun because I have a team following me along the road and encouragement are good for the head. Helen give me the light in order to be sen by the cars. I try to take some soup or cakes because I have not taken any gel since Casaglia. I will walk for long stretches, especially after refueling. I run out of juice, it's a shame because the preparation was good. I really need to get fresh on my next ultras. At least it was a good lesson. I need to remember. You really need to reduce the miles in training when fatigue from the daily tasks in too much. I continue my slow progression. I'm overtaken by runners who manage to keep their speed and I feel they are flying.They run at 12km/h but I feel they run as fast Hussein Bolt. I finally see the light of Brisighella. This is the last big refreshment place of the race and you can feel the end. But the end was just too slow. I'm planning a little over an hour to finish the race, but this year I put more than on hour and twenty minutes for the last 12km. I walk a lot and can not accelerate. Here is the last roundabout (they called it even Passatore like the race) announcing the arrival in Faenza. I start to run again at a slow pace. The straight line is endless. The cold and rain did not permit the organizer to put the podium at km99 to encourage us. The silence is broken by few people who encourage us. The last traffic light and I found Helen to run with me the last 500 meters. I must accelerate to keep this 50th position, and I stop under the red arch. The public tell me to continue because the arrival is 50 meters ahead under the second arch! I almost lost one place! A little rest before starting the training for the next appointment! Thank you to my followers, for photos too. Thank you a Maurzio Crispi for the pictures. C'est un billet du site Whorunswhere ?